From time immemorial, people have sought favours from the goddesss of Fortune, a capricious and sometime elusive woman to woo. Many were the methods used to invoke her grace, such us touching wood or paying homage to certain animals considered by cultures around the world to bring good luck. The fertile frog, the long-living tortoise, the wise owl, the elephant that never forgets, or perhaps the animals from the Lladró Knocks on Wood collection will help to ensure that the good goddess finally similes upon us! This Lladro figurine is brand new and in perfect condition. 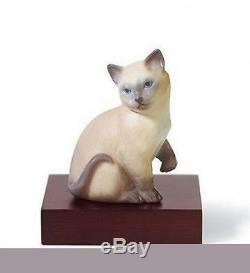 It is made in Spain and comes in the original Lladro Box. The item is of perfect quality, (we do not sell seconds). We are an authorised Lladro stockist and are one of the largest distributors in the United Kingdom. All prices are quoted in Pounds sterling. Please note that Lladro items are dispatched within 10-14 days of placing your order. If there is a delay, we will contact you as soon as possible. We reserve the right to make corrections on any item. We will not process any orders where an error has occurred. The item "LLADRO Porcelain LUCKY CAT 01008102" is in sale since Tuesday, March 22, 2016. This item is in the category "Pottery, Porcelain & Glass\Porcelain/China\Lladro/ Nao\Figures". The seller is "giftwareseller" and is located in London. This item can be shipped worldwide.